Mon, Tues, Fri – 9:30 a.m. to 6 p.m. Wed, Thurs – 9:30 a.m. to 8 p.m.
Saturday – 9:30 a.m. to 3:00 p.m.
Linda Morse, RDO, ABOC, NCLE,joined Parrelli Optical in 2004 after working in an independent optometrist’s office for two years. 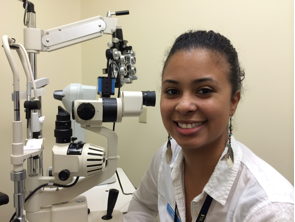 She has successfully completed the state apprenticeship program and is licensed in Massachusetts as a dispensing optician. The Company’s belief in continuing education is reflectedin Linda’s commitment to advanced learning as she was further certified as a Contact Lens Technician in 2009. She is also a member of the Contact Lens Society of America.Linda uses her strong fashion instinct to help patients select the frame that’s right for them. Behind the scenes in the lab, she is skilled in fabricating all types of eyeglass mountings, including plastic, metal, grooved rimless, and drilled rimless. Linda is also one of the “go to” people concerning technical expertise with computer software and programming.For all of her hard work and assistance, Linda was chosen by her peers to receive the 2010 “Best in Sight” award. This award summarizes the highest ideals and performance by a member of the Parrelli team. Rebekah Mongeau, ABOC, Rebekah has worked in the optical industry for over 5 years. She hails from Columbus, Ohio where she is a licensed optician. Rebekah is also nationally credentialed with the American Board of Opticianry. She is currently working as an apprentice in order to become licensed in the state of Massachusetts. Rebekah is also a Masters student at Gordon-Conwell Theological Seminary. She came across the Parrelli family quite fortuitously one fall day in September of 2013 and has been here ever since. Rebekah enjoys the technical side of the optical industry, but her true devotion is a love of fashion! Her greatest joy comes from helping women, men, and children choose the best frame for their face and personal style. Her father’s passion, combined with Elisa’s boundless curiosity about Opticianry, led her to study eyecare and work toward licensure. In 2012 Elisa enrolled at the Benjamin Franklin Institute of Technology (BFIT) to obtain her degree in Opticianry. At BFIT, Elisa excelled in her studies. She found subjects such as ophthalmic optics, the principles and practices of Opticianry, and contact lens theory exciting. Peter Bridger, O.D.,graduated from The New England College of Optometry with a doctor of optometry degree. Before joining Parrelli Optical in 1988, Dr. Bridger provided comprehensive eye care at an independent optical company which he also co-managed.Dr. Bridger earned his undergraduate degree at Northeastern University, where he conducted research in the field of vision. He trained at the Jocelyn Diabetic Center and has expertise in diabetic vision care. Dr. Karen Lewis, Optometrist,Karen Lewis graduated from Gordon College with Bachelors of Arts degree in Biology. Her interest in sight led to several years researching vision at the University of Massachusetts. That work led Karen to focus on patient care. Furthering her education, Dr. Lewis received her doctorate from the Pennsylvania College of Optometry in 1984. She has extensive experience in family eyecare, including contact lens fitting, eye surgery co-management, adult eye care and eye care for children. Dr. Lewis is licensed by the Commonwealth of Massachusetts and is board certified in ocular pharmaceutical agents. Her training and experience allow her to diagnose, treat, manage or co-manage all eye conditions.When she is not in the office Dr. Lewis enjoys hiking, biking and beachcombing with her husband and three children. David S. Metsch, O.D., earned his doctor of optometry degree from The Indiana School of Optometry, and a BS degree from North Carolina State University. He trained at the Veterans Affairs Medical Center in West Roxbury, MA, and has expertise in hospital-based optometry. In 2003, Dr. Metsch was named “Young Optometrist of the Year for Massachusetts” by the Massachusetts Society of Optometrists.Before joining Parrelli Optical in 1998, Dr. Metsch taught at The New England College of Optometry. He has served on the executive board of the Massachusetts Society of Optometrists for many years.